If, like me, you have been ogling the rather splendid gift guides Escentual has put together this festive season, you may be feeling as if you want to get in on the action, I know I certainly do! I definitely find myself wanting everything in ‘the sweet tooth’ category, I know that much. When Emma asked me to put together a gift guide for Christmas I thought I would go back to basics and collate a selection of gifts that are suited simply to those that adore fragrance, in my very own category that I’m dubbing ‘the perfume lovers’. Below you will find a series of fragrant gifts for all types of perfumistas, from the newbies and novices to the olfactory obsessed, and all that’s in between. Each category has a ‘budget’ gift under £50 for the more modest of budgets as well as a ‘blow out’ which sees the aforementioned price restrictions blown well and truly out of the water. So whether you have a demanding perfumista to buy for this Christmas or just someone you love so much you want to shower them with scent, read on because you may just find something of note below! 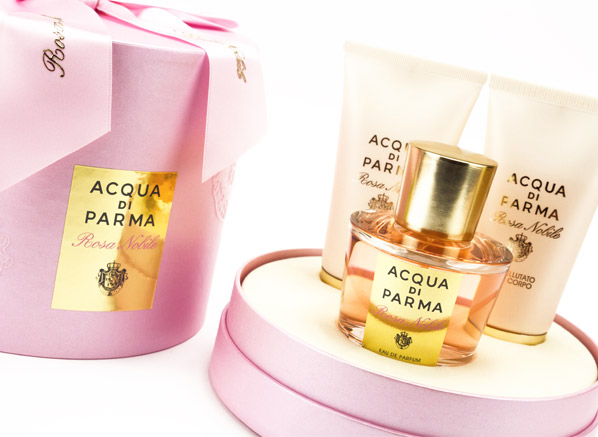 Acqua di Parma is another brand that knows how to do subtlety, simplicity and style in an utterly beautiful manner, and their Rosa Nobile is perhaps the best example of this. Rosa Nobile is a perfect rendition of blush pink roses on the bush, all dewy and sweet with rose water. It has a jewel-like feeling to it and there is no better description for it than ‘effortlessly pretty’. This gift set, which comes with a 50ml bottle of the Eau de Parfum, Body Cream and Shower Gel, is a superb present for someone who wants to elevate their experience of perfume but perhaps isn’t quite ready for something weird and wacky just yet. There’s always time for that later on! Jean Patou’s Joy came one year after the Wall Street crash and as the great depression rolled across America. It was then regarded as the most expensive fragrance in the world. It may not hold that accolade today, but it certainly hasn’t lost any of its lustre or charm. Joy is a symphonic floral that is filled to the brim with golden, bursting jasmine. It’s a timeless floral that hasn’t aged one bit. This fragrance collection presents you with four 4ml bottles of Jean Patou’s most iconic fragrances, including Joy and the new Joy Forever amongst others, which is a modern aldehydic floral (a rare thing nowadays). As far as gifts go, this beautifully presented set allows your lover of classic perfumes to enjoy something old and something new together. Brace yourselves, people, because things are about to get a whole lot more luxurious up in here. That’s right, I’m busting out the big gun: the Extrait of Amouage’s Gold Woman. Launched in the 1980s, Gold was created by the legendary perfumer Guy Robert, who was provided with an unlimited budget and tasked with creating a fragrance for the Omani royal family. As you can possibly imagine, the result is something rather special. Gold Woman is a whirlwind of flowers, supported by hefty animalics and whooshing aldehydes, and tempered with silvery frankincense. The Extrait is more intense and heady than the Eau de Parfum, and it makes an ideal gift for someone who accepts nothing less than the best. At some point, I will stop banging on about just how good Azzedine Alaïa’s debut fragrance, ALAÏA Paris is, but that time is not today, and I’m sure your very own on-trend perfume lover has probably waxed lyrical to you about it too. Inspired by the smell of cold water falling from hot chalk, ALAÏA Paris is an exercise in contrasts, pairing abstract florals with ozonic notes, chilly incense and warm animal notes. The fragrance is hard to pin down and unlike anything else out there. It’s fresh and spiky, but also a little bit warm and milky. A perfect gift for those who are too cool for school. (Psst: It’s outside of my ‘budget’ category, but there’s a gift set, complete with 50ml Eau de Parfum, Body Lotion and Shower Gel for £62. You’re welcome). Etat Libre d’Orange may be having a laugh when they bottle a fragrance under a name that basically means ‘intense nothing’, but this fragrance is no joke. This is a big old smoky leather jacket of a scent with a metric ton of animalic civet. There’s a more pronounced richness thanks to the more intense incense and rose, too. This is the coolest thing you can buy for a perfume addict who will know that Etat Libre d’Orange is just about the most on trend brand out there. The true perfumista requires every aspect of their life to be scented, right from themselves to the environment they inhabit. This means that you may need to top them up on their scented candle stash as well as their perfume hoard. Luckily for you, I have just the thing: the Amande Gourmande candle by Annick Goutal. This candle is a delicious blend of almond blossom and vanilla that is a little bit ‘cherry bakewell’, and I for one want to live in a home that smells just like that. Get this for those that love scented candles just as much as fragrance. Another Amouage for you here, and it’s a great one for the gents. Sunshine Man focuses on lavender but it’s far from a thin and shrill mix of old ladies and dodgy cleaning products, no, no, no! This is a beautifully bold lavender that celebrates the flower’s rich, gourmand facets by pairing it with vanilla and imoretelle. The result is a wave of herbaceous lavender atop a veritable crème brûlée of caramelised sugar. Surprisingly, the whole thing is utterly refined. You owe it to the perfumista gent in your life to get him a bottle. This entry was posted on Wednesday, December 2nd, 2015 at 5:53 pm and is filed under Candy Perfume Boy, Fragrance. You can follow any responses to this entry through the RSS 2.0 feed. You can skip to the end and leave a response. Pinging is currently not allowed.